Paul Murphy believes that the absence of Kilkenny’s retired former heroes has been overstated. 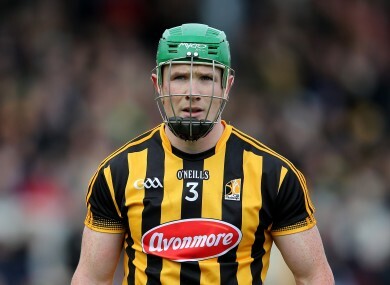 Paul Murphy isn't getting hung up on Kilkenny's retirements and injuries. THERE HAS BEEN plenty of talk this year about the rate of flux in the Kilkenny senior hurling panel. Henry Shefflin, JJ Delaney, Tommy Walsh, Aidan Fogarty, Brian Hogan and David Herity were all members of last year’s All-Ireland winning squad who have since retired. Those waiting for Kilkenny to fall are pointing towards a perceived lack of depth in Brian Cody’s panel. But corner back Paul Murphy is having none of it, pointing out that of the aforementioned sextet, only Delaney started in last year’s All-Ireland final replay victory over Tipperary. And straight-talking Murphy, 26, doesn’t see Jackie Tyrrell’s injury-enforced absence from next Sunday’s All-Ireland semi-final against Waterford as a major setback either. Instead, Murphy insists, it’s a chance for another squad member to step in and stake a claim for a regular starting place. “I wouldn’t call it a blow, a big change is what it is,” Murphy insisted. “Jackie is the most experienced player there. You know what you’ll get from him on any given day, but we probably have three or four players fighting for his jersey the last while, and this is probably a chance for them that wasn’t foreseen a few weeks ago. “We wouldn’t call it a blow, really, it’s one of those things you know will probably happen during the year and it’s a matter of who it happens to. On the subject of retirements, Murphy is equally forthright. “There is (change) from a leadership point of view,” said the Danesfort man. “You go into a dressing-room with Tommy, JJ, Brian Hogan, there was automatically leadership, Henry as well. “The leadership has changed and other lads have maybe said a few words before a match. “In terms of training that dynamic has changed too but we have only lost one player who started the All-Ireland final last year. From that point of view we’re not fazed. Kilkenny also find themselves in the fortunate position where player defections are as rare as hen’s teeth. And who wouldn’t want to stick around for the summer when Leinster and All-Ireland medals are up for grabs? “We feel it’s a great environment to be in, a lot of the lads in our system have done that, going off to the States and that’s great, but there’s nothing compares to training for an All-Ireland, the buzz…you can’t recreate that in America. Murphy decides to pursue other activities in the off-season instead. A keen fan of American Football, he’s enjoyed a couple of trips to the US to watch live games. “I got into it through Jackie (Tyrrell),” he reveals. “It was on RTE when I was younger and on a couple of trips to America I went to a couple of games and got into it. “Jackie and Eoin Murphy are massive into it, I couldn’t hold a conversation with them about it. It’s getting bigger now in Ireland. Of much more immediate concern for Murphy, however, is the prospect of an All-Ireland semi-final against Waterford at Croke Park next Sunday. And Murphy is impressed by the Allianz League champions, who bounced back from Munster final defeat against Tipperary to scuttle Dublin in the recent All-Ireland quarter-final. “You can’t not be impressed with Waterford this year, they’re league champions and they were unlucky in the Munster final,” Murphy agreed. “When Dublin put it up to them the last day they had leaders to stand up, the likes of Maurice Shanahan and Kevin Moran. Waterford’s sweeper system will give Kilkenny plenty to think about but the Cats may adopt a similar set-up themselves. If they do, Murphy insists that he will be ready to play the ‘spare man’ role, if required. “If I’m free because that’s the way Waterford play, fair enough, but the lads will tell us how they want us to line out,” he said. “If they want us to stay free with Waterford’s system, we’ll do that, but I haven’t burdened myself with how Waterford are playing. “If you’re free you have to work twice as hard – the dynamic of not marking a man is that you should be able to get on more ball, and you’re not likely to have a lad skinning you. I haven’t really thought about it, that’s the lads’ job. “It (spare man role) means reading the game, where the ball is going to drop. “If you see a ball coming out of the other team’s defence you have to read where it’s going – ‘this is probably going to land on our 45, I’ve to be over there and if I don’t win the break I’ve to get in there and make sure the opposing forwards don’t get a run in on goal’. Email “'We have only lost one player who started the All-Ireland final last year'”. Feedback on “'We have only lost one player who started the All-Ireland final last year'”.